140 years of celebrating a White Christmas (with a touch of red and plenty of sparkle). 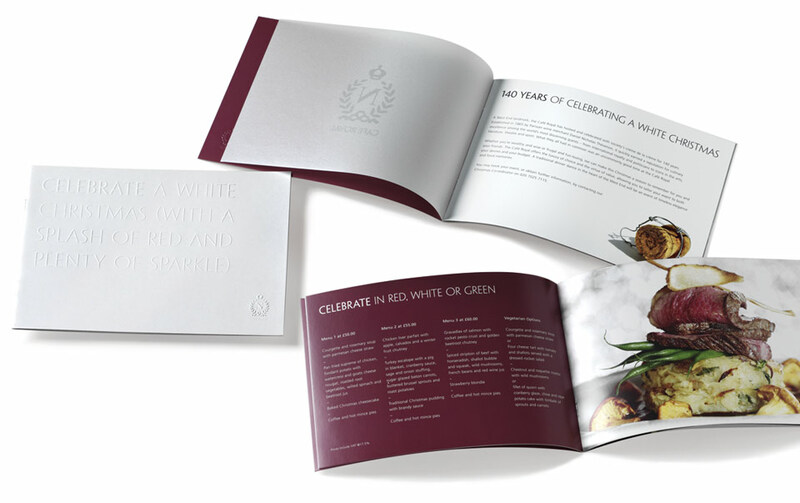 Brief: To create a brochure for Christmas events. Target market & behaviour / insights:People and companies requiring a venue for their Christmas parties or lunches. They want flexibility and choice but also character and a great atmosphere. How do we want them to feel: This place has an amazing interior, character and fascinating history. It’ll be an unusual and exciting Christmas venue. The proposition: Cafe Royal – a great and unusual venue for your Christmas event. The outcome: Transparent papers, blind embossing, rich colours and evocative imagery were used to complement the copy and make for a very successful venue brochure.